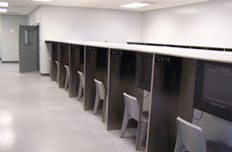 The Jail uses video visitation to minimize the potential introduction of contraband during the visiting process and to reduce inmate movement. In order for an inmate to receive a visit he/she must be incarcerated for at least 72 hours. If you wish to visit an inmate, the inmate will first need to tell you the proper time and date that he/she has scheduled the visit for and you must be prepared to present state, or government photo identification at the time of visitation. All visitors may be checked for outstanding warrants at check in. Any visitor found to have outstanding warrants will be placed under arrest. Be aware that an inmate may refuse to see any visitor. Out of state visitors who present an out of state picture I.D. may be granted one unscheduled visit if space is available. Please visit scheduling page to schedule both Online as well as Onsite visits. Visits that are pre-scheduled take priority over walk-in visits. * Schedule time is subject to change depending on facility’s operational status. Visitors suspected of being under the influence of alcohol or drugs will not be admitted to the facility. Children cannot be left in the Lobby unattended. Visitors may not give or receive anything from an inmate. No personal effects such as purses, cell phones, smoking materials, are allowed in the visitation area. All visitors are subject to search before entering the visitation area, refusing to comply with a search request will result in the denial of visitation. Members of the Clergy related to an inmate fall under the rules of general visitation. Any visitor who exhibits disruptive conduct or behavior may have their visit cancelled at any time. Visitors will not enter any areas of the facility except approved routes to and from the visiting area. No food and/or beverages will be allowed in the visitation area. Visitors must wear proper attire which conforms to reasonable standards. Halter tops, underwear-type t-shirts, tank tops, fish net shirts, or any type of shirt or pants made with see through fabric are not allowed by any visitor (male or female). If the Visitation Officer feels that a visitor's clothing is inappropriate, the visit may be denied. Visitors must remain fully clothed during the visit. Shoes and shirt are mandatory. 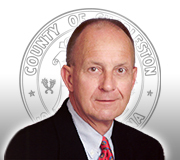 The Sheriff Al Cannon Detention Center operates a cashless system for inmates. This means incarcerated individuals are not allowed to have U.S. currency. Every inmate in the facility has an account that allows the inmate to make purchases from the commissary. The inmate will utilize their inmate number located on their armband and their birth date to use the kiosk system in the housing units to place orders. A maximum amount of one hundred dollars can be spent each week on commissary; however all items must be stored in the inmates bin or box. Money can be deposited into the inmates Canteen account at the Kiosk located in the Sheriff Al Cannon Detention Center Lobby, or by sending money orders through the U.S. Mail (Do not send Cash or Personal Checks), or online at www.McDanielsupplyCo.com. All money orders should be made out to the Sheriff Al Cannon Detention Center. The inmates' name and number should only be placed on the memo line. Any money orders altered or made out in any other manner will not be accepted and will be returned to sender. For money to be available for inmates to use for Canteen it must be deposited before 4:30 p.m. on Sunday. Inmate's valuable property, personal property, and money may be released to any person between the hours of 7:30 a.m. - 4:30 p.m. and 7:30 p.m. - 4:30 a.m. daily. The inmate will verify the identity of the person receiving the property or money by viewing the provided picture identification card and the inmate will approve/disapprove the release by signing a Valuable Property/Cash Release Form. Money will be released in a check made out in the inmate's name only. Checks will not be given to inmates to be endorsed. Put your name and return address on the envelope. If an envelope arrives at the facility without a return address the envelope will be returned to US Postal Service. Put the inmate's full name (the name in which they were booked in under). The only mail inmates are allowed to receive are letters. No packages are accepted at the SACDC. All incoming and outgoing mail will be inspected for contraband. Any mail found to contain contraband will be held by the SACDC and may serve as the basis for disciplinary or criminal charges. Musical or electronic greeting cards. Upon completion of the booking process, inmates will be allowed access to a telephone where they will have the opportunity to make a free local telephone call to notify their family, friends, or attorney that they have been arrested. All inmate phone calls after processing are collect calls in nature. If an inmate attempts a collect call and the call cannot be accepted for billing or blocking issues, the inmate and family member will hear a recorded message from GTL explaining how to set up an account. The telephone number to contact GTL is (866)230-7761.